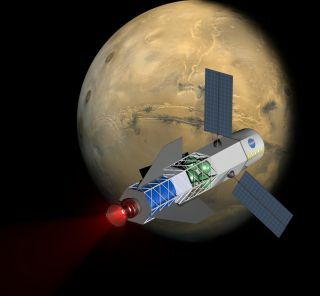 A concept image of a spacecraft powered by a fusion-driven rocket. In this image, the crew would be in the forward-most chamber. Solar panels on the sides would collect energy to initiate the process that creates fusion. Nuclear fusion, the energy source that fuels the sun and other active stars, could one day propel rockets that allow humans to go to Mars and back in 30 days, researchers say. Fusion-powered rockets promise to solve problems of deep-space travel that have long plagued plans for manned missions to Mars — long journeys, high costs and health risks, among them. Scientists at the University of Washington and a space-propulsion company named MSNW say they are getting to closer to creating a feasible fuel for travel to other planets. "Using existing rocket fuels, it's nearly impossible for humans to explore much beyond Earth," John Slough, a UW research associate professor of aeronautics and astronautics, said in a statement. "We are hoping to give us a much more powerful source of energy in space that could eventually lead to making interplanetary travel commonplace." Previous estimates have found that a roundtrip manned mission to Mars would require about 500 days of space travel. Slough, who is president of MSNW, and his colleagues calculated that a rocket powered by fusion would make 30- and 90-day expeditions to Mars possible. The project is funded in part through NASA's Innovative Advanced Concepts Program and received a second round of funding under the program in March. For comparison, past NASA studies have centered on Mars flights that would take two years to complete, and could cost $12 billion just to launch the fuel needed for the mission, according to Slough's team. Nuclear fusion occurs when the nuclei of two or more atoms combine, resulting in a release of energy. The sun and other stars convert this energy into light, and the same process gives hydrogen bombs their destructive power. But to use fusion to power a manned spacecraft, a more controlled process is needed. The fusion driven rocket test chamber at the UW Plasma Dynamics Lab in Redmond. The green vacuum chamber is surrounded by two large, high-strength aluminum magnets. These magnets are powered by energy-storage capacitors through the many cables connected to them. Image added April 10, 2013. Lab tests by Slough and his team suggest that nuclear fusion could occur by compressing a specially developed type of plasma to high pressure with a magnetic field. A sand-grain-sized bit of this material would have the same amount of energy as current rocket fuel, the team says. To get this fuel to propel a rocket to Mars, the team says a powerful magnetic field could be used to cause large metal rings (likely made of lithium) to collapse around the plasma material, compressing it to a fusion state, but only for a few microseconds. Energy from these quick fusion reactions would heat up and ionize the shell of metal formed by the crushed rings. The hot, ionized metal would be shot out of the rocket nozzle at a high speed. Repeating this process roughly every minute would propel the spacecraft, the researchers say. Slough said the design is fairly straightforward. The next step of the team's work is to combine each of the isolated tests they've already completed successfully into a final experiment that produces fusion using this technology. "We hope we can interest the world with the fact that fusion isn't always 40 years away and doesn't always cost $2 billion," Slough said in a statement.